Stonewall is one of the oldest and most respected GLBTI activist organisations in the world. They put together, back in 2010, a "Guide for Gay Dads". It is well worth a read. At Stonewall we have worked hard to ensure that gay people can have and raise children like everyone else. While our lobbying has helped changed the law – allowing gay couples to adopt, removing barriers to fertility treatment for lesbians and outlawing discrimination in goods and services, including organisations offering social and family services – there is still lots to do. That is why Stonewall has published A Guide for Gay Dads, a new guide for gay men taking them through the choices available to them to starting a family. Not only does the guide give vitally useful legal advice on what parenting rights you may have in different situations but it gives you an overview of what you can expect from each route to becoming a dad. 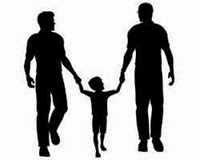 Given the recent changes to the law it is a must-read for any gay men considering starting a family. It’s the latest in a programme of recent work to ensure lesbian and gay people can start families and bring up children free from homophobia. Earlier this year we published our groundbreaking (Different Families) research which for the first time allowed the overwhelmingly illuminating voices of children with gay parents to be heard and last year we published (Pregnant Pause), a guide for lesbians on how to get pregnant.